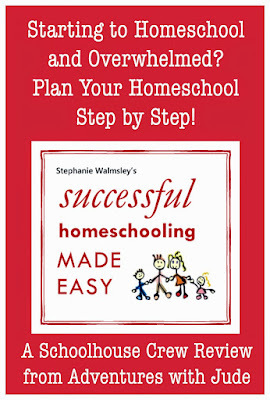 Recently, we were chosen to review the Successful Homeschooling Made Easy Course by Stephanie Walmsley. 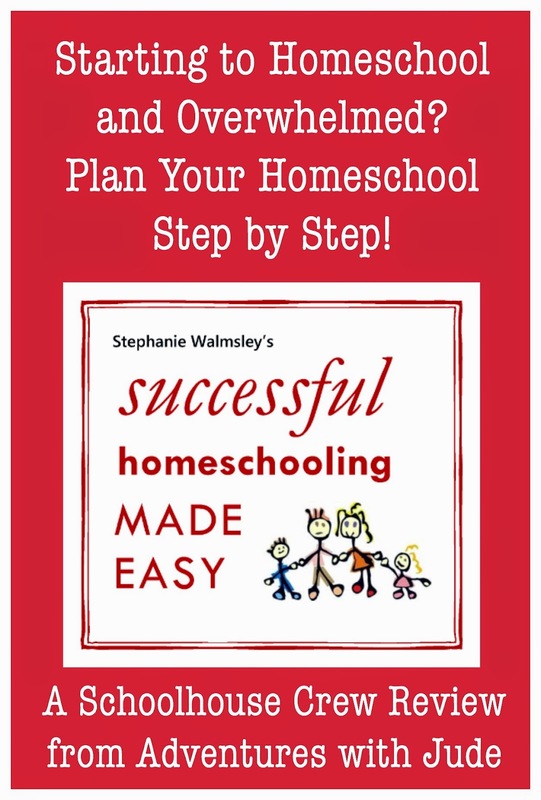 The goal of Successful Homeschooling Made Easy is to help new homeschoolers navigate a sometimes intimidating array of choices. Even as "experienced" homeschoolers - this is our fourth year of homeschooling - there's always something new to learn. This 26-week course covers all the basics of homeschooling itself - schedules, organization, lesson plans, and choosing curriculum - as well as ideas for balancing homeschooling, homekeeping, and family life. The lessons arrive via weekly email. I had a mixed experience with this system. While this is great way for information to not seem overwhelming, I found that often I needed to hunt the emails. This may be partly due to my email address (I use a gmail account for homeschool work), but she does address that sometimes, overeager filters can send the emails to spam. If you don't receive the next email within about a week of the last, you may need to go hunt them down. I finally was able to convince my inbox to sort them by sender, so that even if I couldn't find them in my inbox, I could find them together in their "file." The lessons are written in a conversational style. 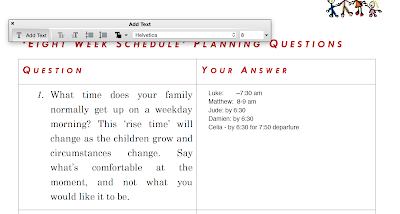 Parents are encouraged to print out the PDF downloads so they can take notes or answer any of the questions asked, and then keep them in a binder. I chose to use the "Writer" feature and type on them, then file on my computer. At the very beginning is "create a schedule." Stephanie also insists it be realistic. In other words, write down the time you actually get up and moving, not the time you'd like to. She also asks you to include extra time in your estimates - for example, once you've calculated your "morning routine" time, add a twenty minute buffer. I think this is a good idea, because invariably I will plan on something taking "just a few minutes" and it takes double! However -- and at the risk of sounding like Debbie Downer at the very start, basing our homeschool off of a schedule is like trying to pin Jello to a dartboard. The only thing standard is that nothing is standard, from what appointments we have on the calendar for the day to just what time Celia needs to be picked up in the afternoon. Realistically, we just work through the to-do list and keel over into bed at night. But, trying to keep an open mind, I set that part aside and figured maybe the rest would help, and we can come back to the schedule idea later. Next is the idea of a "Literacy Hour" - everyone sits down at the table and writes. (She is clearly adamant that this is a group exercise.) For a younger child, it might only take five or ten minutes of writing, for an older student, it would be closer to half an hour with reading taking the balance of the time. Each works to his own ability during this time. Again, I like the idea. However with two younger children who need assistance - a preschooler who is still working on pencil manipulation, and an emerging reader/writer who can think in sentences but only transfer idea to paper one word at a time - and one of me, this left me feeling like a ping-pong ball. I spent a lot of time saying, "Please wait a minute...please wait your turn..." during "Literature Hour" when everyone had questions at once, rather than being able to give one child undivided attention. We ditched that idea by the end of the week, especially because it was difficult to line up everyone's schedules with online classes and doctor/therapy appointments. I also was not a fan of the her idea that I should use a pencil to correct work because it was "more gentle" than a pen. I'll start with "I've seen my papers be a sea of red and turned out ok," and end with "How can you tell what your mistakes are if they blend in with the rest of your writing?" Even just correcting spelling, the boys struggled to see what they needed to fix when they made revisions. I went back to my red pen. Already, I was getting really skeptical that this is going to be a practical support for us. However, it was only Week 1, so I tried to keep an open mind. Lesson 2 is a bit more practical - how to teach math. She includes a 12-point checklist to help you choose a math curriculum. This is actually pretty helpful. There are lots of questions to ask yourself about a program, and it includes the caveat that "just because it's popular, doesn't mean it's the 'best' one for you." VERY true. I also think this list can be applied to ANY program. What I would add is that you should do this examination for EACH child. I think it's easy to get caught up in "Well, it was great for my oldest, so we'll just reuse it for little brother," when they're two opposing learning styles. While maybe it doesn't burn quite as badly (after all, at least you have not put out much more money, if any), it may be a losing battle that's going to really frustrate you. Lesson 3 is comprised of sixteen mothers extolling the virtues of homeschooling. Homeschooling rocks! Homeschooling is the way to go! Do it! Do it! Yes, homeschooling is great. Otherwise, we wouldn't be doing it. It fits our needs because of geographic/schedule issues, the special needs that are impossible to accommodate in a public or private school setting (at least not without a huge battle), and yes, I do enjoy watching the light bulbs come on. But it's not all sunshine and fun and a big kum-bay-ah experience. It's rewarding, but it's a lot of work. I wish some of the moms had been honest and said this, rather than just cheering for Team Homeschool. Lesson 4 is mainly a "review" week. Not "Review the lessons," but review your homeschool. How are things going? Do they need adjusting? Are your days fitting in with your life, or do you need to change things? Are you focused on why you are homeschooling, or are you getting pulled in six directions by others' influence? I think this is a good idea for anyone to periodically take an inventory of what's going on. The program also points out that it's OK if it's not going how you wanted, take a deep breath, find the parts you want to adjust, and reboot. Wise advice. The other task is to add something "fun" to your homeschool. If you're following the program, you'll already have math and language under control, so it's time to branch out into a "new" subject. This is a tall order when your students range from preschool to high school. You might decide that each child has an "independent study" type program suited to his needs/interests, or you rotate the interests of everyone. Further lessons get into adding other classes, balancing homekeeping, a candid look on socialization (and over-scheduling!). It also encourages you to look at the larger picture, and not stress over "today" because homeschooling is a marathon, not a sprint. Not bad theory, but putting everything into action just was impractical for our family. For us, there were several flaws in the premise of the program. First, with students at such varied age ranges and schedules, having a "everyone does this at one time" plan is a recipe for chaos. It also doesn't allow for playing to student strengths - one of the reasons we homeschool. 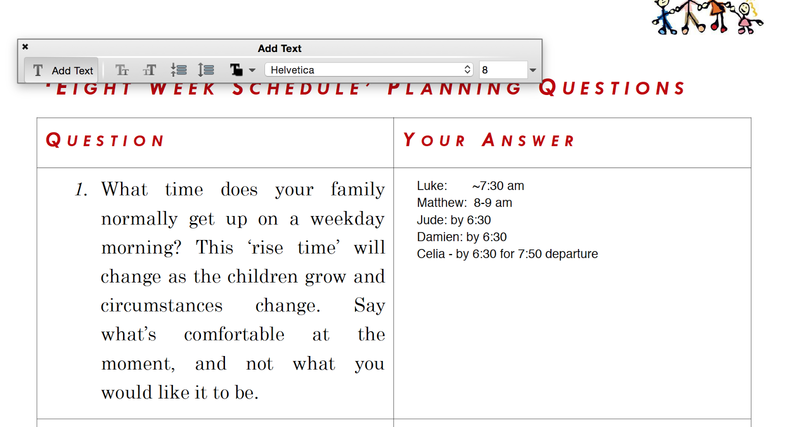 Jude does much better if his schoolwork starts first thing in the morning, while Luke is a better writer later in the day. As a seasoned homeschooler, I'd suggest to a parent, "Consider a 'one room schoolhouse' approach, but keep a rotating schedule idea in the back of your mind, and then each student will get the same core program but when it works for him and when you're not stretched thin helping everyone." I also think the program disregards the legal side of homeschooling. Not everyone has the luxury of taking four weeks to get to adding "extras". If you have a student in high school, you have relatively fixed course of study you need to complete. If you have specific criteria to meet to be in compliance with your state's homeschool laws, you'll likely wind up stressed over the time lost. We are blessed to be in an "anything goes" state, and still wondering "when do we get to..." I have friends in a more regulated states that would be scrambling to make up time. Even in saying "Take what works for you, leave the rest," I found there wasn't a whole lot for us to really take away except the "Why this program?" questions. I've received 9 of 26 lessons during the review period, and honestly, I'm no further to thinking this is "easy" than I was at the start. Were there some good ideas? Yes. Did the program help us overall? Not really.